The NA-16-2K (also known by its NAA "charge code" or "accounting code" of NA-33) was selected by the RAAF for production by Commonwealth Aircraft Corporation. 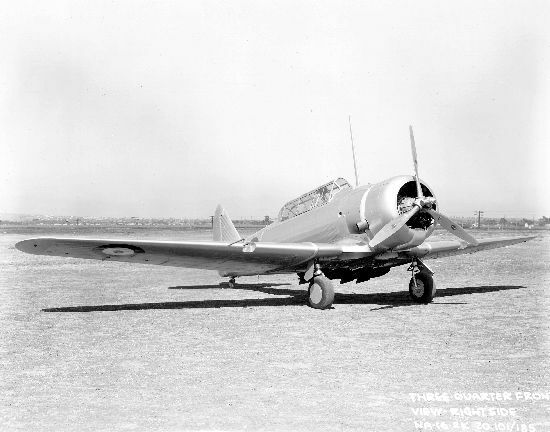 Following a number of modifications to meet RAAF requirements, the production aircraft became known as the Wirraway. CAC ordered one NA-16-2K aircraft for comparative tests against the fixed-gear NA-16-1A aircraft. The NA-16-2K was constructed in 1937 by NAA in their factory at Inglewood, California with the construction number 33-388. This photo shows the NA-16-2K in California prior to it's delivery to Australia. Image copyright expired, courtesy of the San Diego Air and Space Museum archive. Another view of the NA-16-2K in California prior to delivery. It is displayed with four 100 pound Mk. 1 practice bombs fitted under the centre-section of the wing, highlighting it's "basic combat" capability. 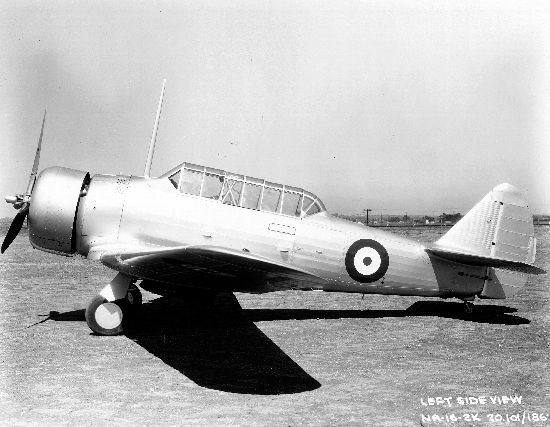 The NA-16-2K arrived in Australia in November 1937. Since it was easier to refer to the plane by its charge code (NA-33) than its model designation (NA-16-2K) it became known in Australia as the NA-33. During December 1937 the NA-16-2K was evaluated in a series of trials to determine its performance in comparison to the NA-16-1A which had arrived in Australia 3 months earlier. Following its delivery to the RAAF in November 1938, the aircraft's history can be traced from its service card. The entries in italics below are taken directly from the service card for A20-2. 8/11/1938 Received No. 1 Aircraft Depot (Laverton) ex CAC. Order number A.33916. Here the NA-16-2K is shown at Point Cook following it's transfer to the RAAF which took place on November 8th, 1938. Note the RAAF serial number repeated on the rudder. Image copyright expired, courtesy of the AWM archive. 12/09/1939 Landed with wheels retracted. Sustained damage. 12/09/1939 NA 33 (A20-2) flown by F/O J. Burgess and (instructing) and F/O F. Wootten (pupil) landed with wheels retracted. No injury to pilots. Aircraft sustained badly damaged airscrew, cowling, flaps and undercarriage. 31/10/1939 Received 2AD ex ARS without engine. 18/06/1940 Approved to be converted to Wirraway Instructional Airframe #1. Here A20-2 can be seen among a collection of instructional airframes at No. 1 Engineering School, at the Melbourne Showgrounds in Ascot Vale. The aircraft is in the row on the left, partly hidden by Bristol Bulldog A12-1. As an instructional airframe, the NA-16-2K was eventually stripped down to enable trainees to learn its construction and systems. Note the single forward-firing machine gun in front of the windscreen and casing ejection chute just aft of the firewall. Some references suggest that the NA-16-2K was armed with a single "wing gun", but this is not the case. The hydraulic ram for retracting and extending the undercarriage can be seen protruding out from the end rib of the wing centre-section. Image copyright expired, courtesy of the Argus Newspaper Collection of Photographs, State Library of Victoria. The NA-16-2K also did its share of raising support for the war effort. Here it is paraded on show through Melbourne city streets sans wings and engine in support of the 4th Liberty Loan Appeal on October 29th 1943. Here is another photo of the NA-16-2K during its career as an instructional airframe, now painted in camouflage colours. In this photo an instructor is showing a group of trainee riggers how to grease the top hinge point of the tail-wheel oleo strut. Note that the negative has been reversed in this photo, so the serial number A20-2 is reversed. Image copyright expired, courtesy of the AWM archives. Details of A46-206 "Millingimbi Ghost" on display at the Museum of Australian Army Flying in Oakey, Queensland. Vella, Joe. The Genesis of the Wirraway, Aviation Heritage - The Journal of the Aviation Historical Society of Australia, Volume 23 Number 1, 1983.